Game Mechanics | mark Joseph "young"
This is mark Joseph “young” blog entry #195, on the subject of Probabilities in Dishwashing. I was going to call this, What Are the Odds?, but that’s too useful a title to use for this. Actually, almost every time my bill rings up to an exact dollar amount, ending “.00”, I say that to the cashier, and usually they have no idea, so usually I tell them. But I’m a game master–I’ve been running Multiverser™ for over twenty years, and Dungeons & Dragons™ for nearly as long before that. I have to know these things. After all, whenever a player says to me, “What do I have to roll?”, he really means “What are the odds that this will work?” Then, usually very quickly by the seat of my pants, I have to estimate what chance there is that something will happen the way the player wants it. So I find myself wondering about the odds frequently–and in an appendix in the back of the Multiverser rule book, there were a number of tools provided to help figure out the odds in a lot of situations. And so when I saw an improbable circumstance, I immediately wondered what the odds were, and then I wondered how I would calculate them, and then I had the answer. It has something in common with the way I cracked the probabilities of dice pools decades back (that’s in the book), but has more to do with card probabilities, as we examined in web log post #1: Probabilities and Solitaire, than with dice. At some point I bought a set of four drinking cups in four distinct colors. I think technically the colors were orange, green, cyan, and magenta, although we call the cyan one blue and the magenta one red, and for our purposes all that matters is that there are four colors, A, B, C, and D. We liked them enough, and they were cheap enough, that on my next trip to that store I bought another identical set. That means that there are two tumblers of each color. 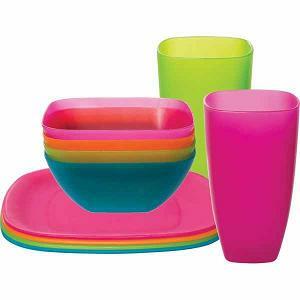 I was washing dishes, and I realized that among those dishes were exactly four of these cups, one of each of the four colors. I wondered immediately what the odds were, and rapidly determined how to calculate them. I did not finish the calculation while I was washing dishes, for reasons that will become apparent, but thought I’d share the process here, to help other game masters estimate odds. This is a problem in the probabilities of non-occurrence, that is, what are the odds of not drawing a pair. The color of the first cup does not matter, because when you have none and you draw one, it is guaranteed not to match any previously drawn cup, because there aren’t any. Thus there is a one hundred percent chance that the first cup will be one that you need and not one that you don’t want. Whatever color it is, it is our color A. In drawing the second cup, what you know is that there are now seven cups that you do not have, one of which will be a match. That means there is one chance in seven of a match, six chances in seven of not matching. This is where I stopped the math, because I hate sevenths. I know that they create a six-digit repeating decimal that shifts its position–1/7th is 0.1̅4̅2̅8̅5̅7̅, and 2/7ths is 0.2̅8̅5̅7̅1̅4̅, and in each case the digits are in the same sequence, but I can never remember that sequence (I don’t use it frequently enough to matter, and I can look it up on the table in the back of the Multiverser book as I just did here, or plug it into a calculator to get it). So the probability of the second cup matching the first–of drawing the other A–is 14.2̅8̅5̅7̅1̅4̅%, and the probability of not drawing a match is 85.7̅1̅4̅2̅8̅5̅%. So with a roughly 86% chance we have two cups that do not match, colors A and B, and we are drawing the third from a pool of six cups, of which there are one A, one B, two Cs and two Ds. That means there are two chances that our draw will match one of the two cups we already have, against four chances that we will get a new color. There is thus a 33.3̅3̅% chance of a match, a 66.6̅6̅% chance that we will not get a match. We thus have a roughly 67% chance of drawing color C, but that assumes that we have already drawn colors A and B. We had a 100% chance of drawing color A, and an 86% chance of drawing color B. That means our current probability of having three differently-colored cups is 67% of 86% of 100%, a simple multiplication problem which yields about 58%. Odds slightly favor getting three different colors. As we go for the fourth, though, our chances drop significantly. There are now three colors to match, and five cups in the deck three of which match–three chances in five, or 60%, to match, which means two in five, or 40%, to get the fourth color. That’s 40% of 67% of 86% of 100%, and that comes to, roughly, a 23% chance. That’s closer to 3/13ths (according to my chart), but close enough to one chance in four, 25%. A quicker way to do it in game, though, would be to assign each of the eight cups a number, and roll four eight-sided dice to see which four of the cups were drawn. You don’t have to know the probabilities to do it that way, but if you had any matching rolls you would have to re-roll them (one of any pair), because it would not be possible to select the same cup twice. In that sense, it would be easier to do it with eight cards, assigning each to a cup. I should note that this math fails to address the more difficult questions–first, what are the odds that exactly four of the eight cups would be waiting to be washed, as opposed to three or five or some other number; second, how likely is it that someone has absconded with one of the cups of a particular color because he likes that color and is keeping it in his car or his room or elsewhere. However, the first question is an assumption made in posing the problem, and the second question is presumably equally likely to apply to any one of the four color cups (even if I can’t imagine someone taking a liking to the orange one, someone in the house does like orange). However, it should give you a bit of a better understanding on how to figure out the odds of something happening. For what it’s worth, the probability of the cost of the purchase coming to an even dollar amount, assuming random values and numbers of items purchased, is one chance in one hundred. That, of course, assumes that the sales tax scheme in the jurisdiction doesn’t skew the odds. This is mark Joseph “young” blog entry #167, on the subject of Cybergame Timing. I’ve played a few games which I am calling “cybergames”. “Computer games” would suggest they are considerably bigger than they are. These are “Facebook games” and cellphone games. What usually happens is a close friend or family member will be playing a game and will “need” another player in order to get certain in-game benefits (a recruitment tool used by the game designers to get people who are playing to coerce their friends to play), so I will join the game and become involved, and then they will stop playing and I’ll realize, gradually, that I’m the only one I know playing this game, and eventually will realize that I’m wasting a lot of time on something that was supposed to be a way of interacting, in some small way, with this other person, and now is about interacting with a central processing unit somewhere. However, along the way, being a game designer and gamer from way back, I notice things about these games, and one of them has begun to bother me. Many of these games have timed processes. That is, for example, you’ll say “build this here”, and it will tell you that it has started building it and the building will be complete in exactly this period of time, a countdown timer beginning. That sometimes limits what else you can do (or requires you to spend resources to do some other things you normally would be able to do “free”), but its primary function seems to be to induce you to return to continue playing the game later. The time units are often intuitively logical–for example, it is often the case that these will be twenty-four hours, or twelve or eight or six, fractions of a day. With the twenty-four hour unit, you think that means you can play the game once a day and hit the button to restart this for the next day–but therein lies the rub. 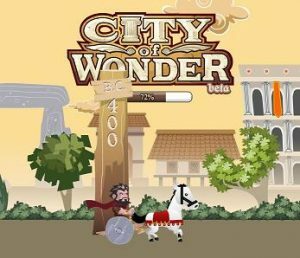 Assume that you are playing such a game, and there is one task that can be done every twenty-four hours–collect a specific resource. Let’s assume you are playing this game every morning before work and again twelve hours later in the evening after supper. Both of those times are going to have a bit of fluctuation to them, of course, and that’s part–but not all–of the problem. So at seven o’clock Monday evening you collect the resource, and that restarts the clock. Of course, there are other things to do in the game–you don’t just collect the resource, you do other game play things at the same time. So on Tuesday at seven the flag pops up to say that you can collect the resource. Odds are against the notion that you are simply waiting for that flag to appear and immediately hit the button, so it will be at least a few seconds–let’s say a minute–before you do. Sure, some days you are going to hit that resource in the same second, but those are the very rare ones. 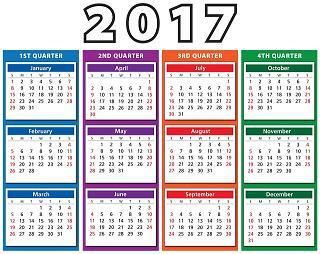 By the end of a week, you are going to have shifted the time that the twenty-four hour resource renews by several minutes–so the next Monday you come to play at seven, but the flag doesn’t appear until five after, or ten after, or some time after the hour. That’s not a problem–presumably you are playing the game for more than ten minutes at a shot, or it wouldn’t be much of a game. 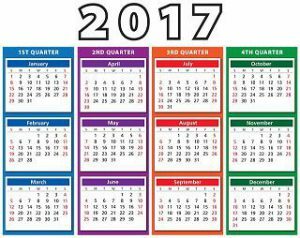 However, you can’t make that clock go backwards–by the next week it will be quarter after, or possibly half past, before the flag appears. Probably it’s not a game that you play for half an hour, at least not every night. At some point, you give up waiting for that flag, and it “appears” in the program after you’ve shut down the game. When you restart the game at seven in the morning, there it is. And now you repeat the same process in the morning, until you have to quit the game and leave for work before the flag appears. You lose a day of resource generation, and it returns to an evening task. Not a big deal? However, this same problem affects all tasks of length, whether twelve, eight, six, four, or even three hours: no matter how frequently you play the game during the day, eventually the task will be unfinished twenty minutes before you are going to bed, and you will have to choose whether to stay up and hit the button late or go to bed and pick it up in the morning. What seems like a game mechanic that pushes you toward a regular play schedule actually prevents a regular play schedule, because it shifts against the clock slightly each time. The obvious solution to this problem is a game design correction: replace those seemingly intuitive chunks of turnover time with rather unintuitive shorter ones. Have the resource renew in twenty-three hours, eleven and a half, eight and two thirds, six and a three quarters, four and five sixths, three and seven eighths hours. This lets the player show at a regular time and find the task complete and waiting for replay. It avoids the frustration of having to wait until tomorrow morning simply because it’s not worth waiting another twenty minutes tonight. It’s a better game design. Anyway, that’s my suggestion. I would probably find these games a bit less frustrating (and really, do you want your game to be frustrating?) if that were fixed. This is mark Joseph “young” blog entry #44, on the subject of The Feeling of Victory. 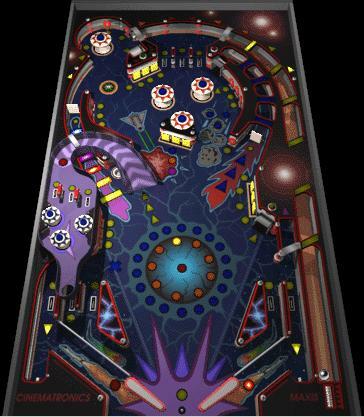 Moments ago I finished a game of computer pinball, and it was such an exciting finish–on the final ball I finished the extra point task list, crossed the two million mark, and lost the ball, all within a second, and I couldn’t help going, yes. It illustrates something that every game designer and every role playing game referee needs to grasp. It is something inherent in Multiverser, something that I tried to capture in the novels. Some call it the “payoff”. It’s the feeling, perhaps the “rush”, you get when you do something special. Note that you don’t have to win. You don’t even have to break even. You don’t have to have reached some pre-defined goal. At no point did I think that I wanted to reach two million–on throwaway games of pinball, I figure I did fine if I passed the million mark, and I’d done that. Nor did I give much thought to whether I was going to “complete the mission” by hitting all the intended targets. It was this juxtaposition, the unexpected success on both of those in-game milestones at the moment of defeat. After all, let’s face it, you never “win” pinball. It’s not like Solitaire, where sometimes you win and sometimes you lose and if you know enough you can improve your odds. With pinball, you keep playing, and you keep winning, until suddenly you lose. You can count it a win if your particularly high losing score is high enough to put you on the leader board. Yet this unwinnable game has an appeal of its own, an appeal that comes from the small victories along the way, and particularly from the unexpected ones, the ones that come in under the wire, the ones that surprise. It’s fine for me to lose, as long as at some point I felt like I won–even if it’s the same moment. It’s fine to run or design a game in which people lose. In Multiverser, player characters get killed all the time. Ron Edwards once wrote that the game had some of the best answers to the problem of character death, because we use it to advance the plot into the next adventure. You lost the round; get ready for the next round, because you get to keep playing, you’re just on a different board. The game you lost isn’t lost if you won something along the way, and the sting of defeat is considerably mitigated by the thrill of a victory gained at that same moment. People love their victories, but they also love their glorious defeats. Icarus may have crashed and burned, but for a moment there, he was flying. This is mark Joseph “young” blog entry #40, on the subject of Multiverser Cover Value. In a thread on Facebook on a completely different issue (an article I encountered on an effective non-lethal weapon) posters made some comments about the complexity of the Multiverser game system. 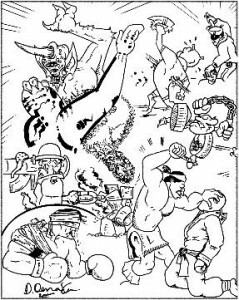 I don’t happen to think it that complex, really (to create an Original Advanced Dungeons & Dragons™ character without limiting in advance what the player might want to be, the referee needs to have access to twelve of the thirteen hard-cover volumes), but they did tackle two of the more complicated areas: the spell system and the way to calculate cover value for armor. I promised to provide answers, and since I no longer have the Gaming Outpost forum for such things, the answers are going to land here. We previously addressed the issue of Multiverser magic; this entry will deal with the cover value problem. While you’re talking about complicated math in multiverser, I’m surprised no one has brought up Cover. That was one of the first things I changed when I was trying to streamline the system. 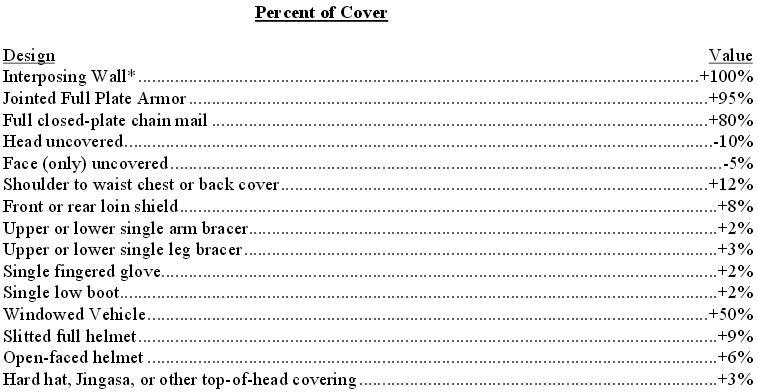 The math for Cover can get ridiculously complicated when you’re wearing layers of armor. “Add this, divide that. Take into account material density.” I abandoned it in favor of a system that focused more on where you were hit and ascribed a damage value to each piece of armor. I’m not saying that the Multiverser system’s way of dealing with it is bad. I’m just saying that it’s needlessly complex, basically no matter what we’re trying to do. Well, in my defense, the rule book does say that calculating cover is a complicated bit of math–but at the same time, that you don’t have to do it generally, as once for any piece of armor is sufficient. Reading some of the other comments on the thread, I’ll note that if for Multiverser purposes you’ve calculated the “cover value” of five different pieces of armor, and you wear them all, your cover value is simply the sum of all the pieces you’re wearing, even if they cover the same body parts. So the math is only difficult when a particular piece of armor is created or acquired, and after that the only question is whether you’re wearing the same pieces or left something off. So, what is the complication? How well armor protects is based on two factors, one of which is also based on two factors. The one factor is how much of the body the armor covers. It is kind of the joke that people wear bullet proof vests but are easily killed by a shot to the head. That’s why combat and riot gear includes helmets. The system would be complicated indeed if we required the referee to work out how much protection was afforded to each part of the body, but we allow a sort of fiction here–if you’re wearing a bullet proof vest, you are that much harder to hit, and the “cover value” takes into account that blows against your torso are less likely to penetrate, even though your head is still vulnerable. In theory, someone can aim for an unprotected head, but they’d take a size penalty on the shot. The second factor is how difficult it is to penetrate. We know from history that iron armor protects better than bronze armor, because iron weapons are more likely to penetrate bronze armor but not iron armor. It thus follows that a suit of white dwarf alloy (if such a thing could be obtained and worn) would protect better than a suit of aluminum. We cover this factor with a density number–nothing too scientific, just the application of a game concept of “density” extended to cover materials that have not yet been created. We also allow the issue of thickness, when it comes to armor–if you make your armor twice as thick, it’s more difficult to penetrate–but that particular factor is usually ignored because thicker armor of that sort is overly restrictive: armor that is twice as heavy is only twenty-five percent more protective. How much of your body is covered by the armor? How hard is it to penetrate the material covering it? It’s not usually difficult. For example, let’s suppose someone gets a full suit of jointed full plate armor. The book suggests that such a suit covers ninety-five percent of the body–there are some slots for vision and air in the front of the visor, and a few small gaps where the metal comes together most of which open and close as the body moves. It would be made of a relatively hard metal, but that could be a softer one like bronze or a harder one like steel. Thus there’s a range of densities for hard metals, from 2@6 to 4@8. From there it’s simple to convert the values to “decimalized” numbers and multiply. If we’re looking at 95% coverage at 2@6 density, that comes to 26 x 0.95=24.7, which we round to 25, a 25 percentage point penalty on incoming attacks. If we have heavier denser metal, say a 4@8, that’s 48 x 0.95=45.6, again rounded to 46. That makes it look complicated–add this, subtract that, put it all together to get a number–but ultimately, all it’s really saying is, figure out how completely the wearer is covered. It tries to take into account things that should be considered–chain doesn’t really cover your entire body because it has little holes in it, and we’ve all read stories about the arrow or knife that went through the holes in the chain armor. 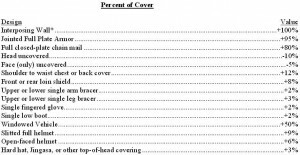 Ultimately, though, all the referee really needs to do is decide what percentage of the body is covered–or conversely not covered–to get his basic “percent covered”. That’s all that that table is for. The second complication arises, though, when players attempt to “game the system”. They’ll usually try to make armor thicker to get more protection out of it–and sure, a phone book is harder to penetrate than a manila envelope, so thickness does matter. It does not matter if the design uses layers–that is, if you’re wearing a chain shirt under solid breast and backplates, you get the full value of both. It’s only complicated if you make the material thicker, such as making the breastplate half an inch thick instead of a (standard) quarter inch. That requires a bit of math–but the thickness of the armor is not going to change, and wearing multiple layers of armor is simple addition, so you only have to do the complicated bit once. After all, how many times does someone get a new suit of armor? A few minutes to work out how effective it is should not be that much of a problem. The game also has rules for ablative armor–armor which protects by absorbing damage–but these rules in essence say that unless the ablative armor is also stated to provide cover value, it does not provide cover value and so isn’t part of this calculation at all. There can also be complications if someone is hiding behind a wall and someone else is destroying the wall, but that’s an attack on cover or structures, not at all about armor, so it’s not part of the usual “cover value” issue. This is mark Joseph “young” blog entry #38, on the subject of Multiverser Magic. In a thread on Facebook on a completely different issue (an article I encountered on an effective non-lethal weapon) posters made some comments about the complexity of the Multiverser game system. I don’t happen to think it that complex, really, but they did tackle two of the more complicated areas: the spell system and the way to calculate cover value for armor. I promised to provide answers, and since I no longer have the Gaming Outpost forum for such things, the answers are going to land here. This entry will deal with the magic. My biggest problem – and the thing I houseruled away most frequently – is that MV’s magic system, as written, insists that /any change/ no matter how minute results in a completely new spell. So if I have a “Battle Blessing” spell that normally takes 1 minute to cast, and I decide that today I need to rush it and cast my “Battle Blessing” in 10 seconds… normally you would think that this is my normal “Battle Blessing” spell, albeit with a skill penalty for rushing, right? That’s intuitive… No, it’s an /entirely new/, but /otherwise identical in every way/ spell… that does not inherit the Skill Ability Level for the spell its based on. So if I was 2@8 on the original Battle Blessing… maybe I’m 1@3 on the /identical/ rushed version…. and both need to be leveled up separately. At one point I think my actual Verser self had something upwards of four different copies of this same spell, the only difference being one was a shorter casting time, or one affected three people instead of five, or something like that. It got out of hand very quickly. I hated this from the first time I saw it happen, and consequently have never enforced it on the handful of players I ever ran for. It’s a valid point: if you know how to perform some kind of magic, shouldn’t you be able to perform it more quickly if you’re in a situation in which you need to get it done fast? However, I have two answers for this. The first has to do with “game balance” in mechanics. That was always a big deal before Vincent Baker’s Lumpley Principle and Ron Edward’s Model, and it’s still a big deal in complex game design. It means, among other things, that every power has limits so that it won’t dominate the game. Magic, in Multiverser, has essentially two limits. One is the same limit that applies to technology, psionics, and even to body skills: bias, which determines what is possible or impossible in a given universe, and how difficult it is to do. It’s a relatively simple system given the complexity of issues it addresses, but it’s not at issue here. For any given magic outcome, either it is or is not possible in the present world, and it can be more or less difficult. The other limitation is the one at issue. In Multiverser, you can design your own magic skills. You can say that you want to achieve this result–create fire or lightning, charm an enemy, pass unnoticed through the midst of a crowd, fly–and that you are going to take these steps to achieve it. The simple form of the rule is that the power you get from a “spell” is proportional to the effort you put into it. That effort can take the form of sacrificing objects of greater or lesser value, speaking loudly or gesticulating wildly in ways that call attention to yourself, saying words that broadcast what you are attempting to do so the target can take countermeasures, and, almost always, how much time it takes to cast it. The battle blessing in particular is significant in this regard: a two-minute spell to enhance your combat abilities means that for two minutes you have to stay out of the fray, which might not even be possible; the same spell in twelve seconds is going to be very nearly something you can do while drawing your weapon. Obviously, though, if we assume that the battle blessing does exactly the same thing to the same degree at the same probability of success, no character in his right mind would take two minutes of valuable combat time to cast a spell he can cast in twelve seconds. Thus part of the solution to prevent that is that the probability of success on the twelve-second version is considerably lower than that on the two-minute version. Assuming everything else to be the same, the longer spell is probably about thirty percentage points more likely to be successful than the short one. That can impact whether or not it works, of course, and also because of Multiverser’s relative success rules it can also impact how well it works, because a higher successful roll normally delivers a better outcome. Understand, too, that I believe in running an equitable game. If when you create this spell you get this bonus for shouting, everyone should get that bonus for including “shouting” in any spell design; it becomes the “shouting bonus”. I have a list of standard bonuses for standard “spell components”, and when someone comes up with some new component I had not previously considered I compare it to my list and then attempt to make note of what I decided so that if they do it again, or someone else at the table does it, I will treat it consistently. When you create a spell, I look at everything you’re investing in success, and crunch the numbers, and I give you a number, a “situation modifier”, to record with the spell description that says that this spell is this percentage more or less likely to work than the baseline. You get that bonus–or penalty–whenever you use that specific spell. But if you modify that spell in any way, you’ve changed the bonus or penalty. Of course, I could let you change the spell for a specific casting–but that means that when you do that, I have to recalculate the chance of success anyway. And in doing so, I’m probably going to have to look up the baseline for the spell, figure out what elements you are using and what value I gave each of them originally, and work out the new chance of success pretty much as if it were a new spell–and seriously, how much of a two-minute ritual can you cram into a twelve-second rush casting? And does it make sense to say that because you have done this two-minute ritual before a couple times you will be just as good at doing the same ritual in twelve seconds? I think of the fast talker competition, where someone holds the record for the fastest delivery of a particular Shakespearean sililoquy (I cannot now recall whether it is from Hamlet or MacBeth). Does the fact that you recited that sililoquy a couple times mean you can now challenge the record? You can deliver such a speech at a reasonable pace and allow yourself time to think of the next line without looking as if you don’t know what you’re doing; you can’t spit it out at record time if you have to think of the words. Believe me, I’ve sung a few songs that have incredibly rapid-fire lyrics, and you had better know them cold if you expect them to make it to your lips. So I have to recalculate, and I probably don’t have the original calculation handy (why clutter your character paper with the detailed numbers, particularly when that’s not character knowledge?) so I’m starting from scratch. And if you’re forcing me to start from scratch to recalculate your chance of success for what is necessarily a different ritual (because it runs a different length of time) that feels to me like you’re doing a completely different spell, and I want it on your sheet for the next time you decide you want to do it in twelve seconds instead of two minutes. 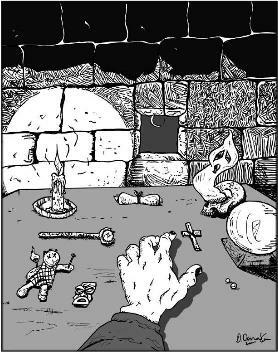 It really is not the same spell just because it has the same outcome, any more than striking a match, using a cigarette lighter, and rubbing two sticks together are the same skill even though they all produce fire. You are attempting to achieve the same outcome a different way, and the simple fact that you want it to happen more quickly proves that this is the case. Of course, it does make sense that if you’ve done the same skill enough times you would be able to do it in less time. That’s true when I cook, certainly, as once I know the recipe I’m not stopping at each step to check it. And that leads to the second answer. It’s built into the system that when you have used or practiced a skill long enough/enough times to be good at it, your “skill ability level” crosses the line from amateur to professional, and whenever you perform that skill you do it in half the time. Your two minute skill takes only sixty seconds. Continue at it and eventually you will be an expert at that skill, and it will take only one third as long as it took when you were an amateur–in this case, forty seconds. No, that’s not twelve seconds; but if your ritual requires singing four verses of Onward, Christian Soldiers at thirty seconds per verse (sorry, Harry, it was the first decent example that came to mind), you’re going to have a lot of trouble getting it as fast as ten seconds per verse. So “faster” is built into the system, but only after a lot of practice. If you want the same outcome in less time, you really are trying to figure out a “faster” way to do it. There is a saying in business, something like “Fast, good, cheap, pick two.” If you’re trying to get fast, you have to trade something for it–you’re doing it a different way, and a different way means a different skill, even if it’s a choice between the American Crawl and the Breast Stroke. Keep doing it the same way and you get better at it; change the skill, and you’re learning more skills. There’s nothing wrong with learning more skills–if one fails, you can use another. In fact, if you botch on a skill you’re not permitted to retry it again immediately, but you are permitted to try a different skill that does the same thing, so having multiple versions of a skill can be useful in a pinch. Anyway, that’s how it works and why. I know it frustrated you; it frustrated me that you couldn’t see that to be the same skill it had to be done the same way. Eric does all of this by the seat of his pants, and you can do it that way. I don’t, because I am not good enough to keep the playing field level if I don’t keep track of the rules–but Eric is more like Ed in that regard, and doesn’t much care whether the playing field is level as long as it tells a good story. It’s harder for a good player to play in a world like that, though, because things are not predictable–a spell that should be easy winds up being hard, because the same standards aren’t maintained from one to the next. Part of play is learning what works, and what makes it work better. If the standards shift, you can’t learn that. It can still be fun, but it’s not quite the game we designed. I also sympathize with your feeling, Harry, that you were trapped in the same world for a long time. It’s not entirely my fault–people who stay with the ship take risks of being versed out in a lot of ways, and people who settle into city life, even taking a job with the city watch and starting a fire department, are not taking the same risks. My second world was a modern vampire setting, and before long Ed was becoming frustrated trying to find ways to get me out of it, because I kept playing smart enough to beat his killer monsters. Eventually he stopped running the game, and I was never really out of there; two other referees tried to pick it up, but they couldn’t see how to get me out, either, and both gave up on it. Kyler was stuck in NagaWorld so long that he had to dream up something plausible but truly dangerous to try to get himself out of there. Being stuck in a world in Multiverser seems to be proof that you’re a good careful player who knows how to stay alive. It’s a compliment. Reckless players jump from universe to universe. You were never that. I’ll address the cover value thing in a couple days, probably.